Long-time GT racer Ian Khan has already raced two new GT3 cars this year: his regular mount in the FIA GT3 Championship, the #32 JMB Ferrari 430, plus a Pouchelon Viper in the recent non-championship races at Pau – where he managed a second and third place, “and in the second race the Pouchelon Vipers lapped everyone else”. Ian Khan is expecting to race in the Proximus 24 Hours with regular Viper man Anthony Reid, plus two of the Tech 9 Porsche drivers from the GT3 Championship - Paul van Splunteren and Maxime Dumarey. An idea has been suggested in which GT3 teams make up the 24 Hours numbers by running in a kind of relay race, passing the baton (transponder) from car to car – but Ian Khan and friends are out to do it properly. 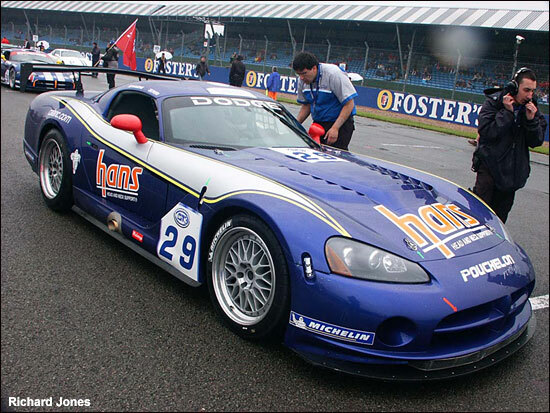 This is the Reid / Duqueine Viper on the grid at Silverstone. The Spa 24 Hours test day takes place on July 5 - but before that, it's the GT3s (and GT1s and 2s) at Oschersleben this weekend..